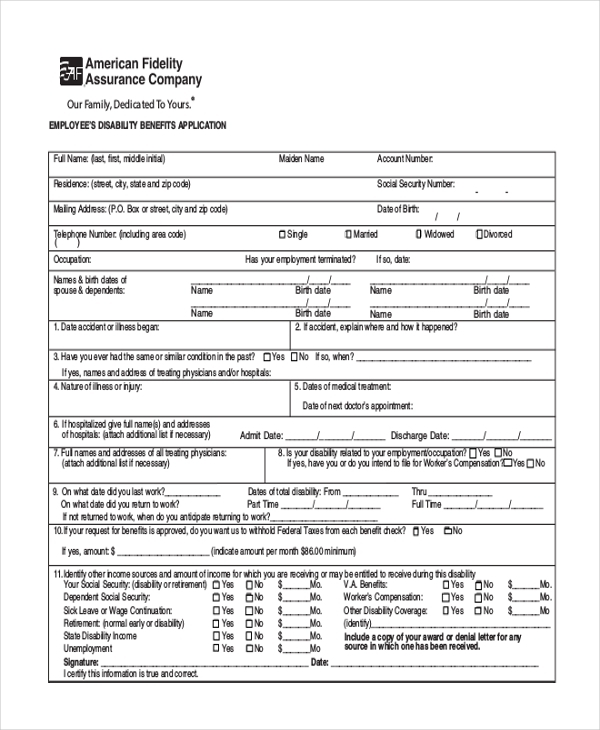 A disability claim application form is used by government agencies that offer to its national disability claim cover and support the dependents of the family member. 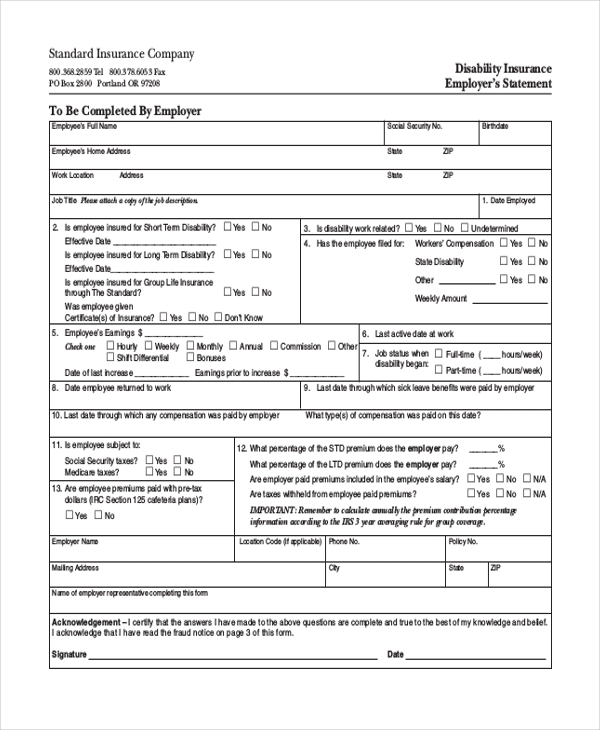 In such type of application form, it is necessary that all the relevant information relating to employment history, dependent family members etc; should be provided accurately. Educational institutions offer disability allowances to students suffering from a physical or mental handicap, to support their studies. 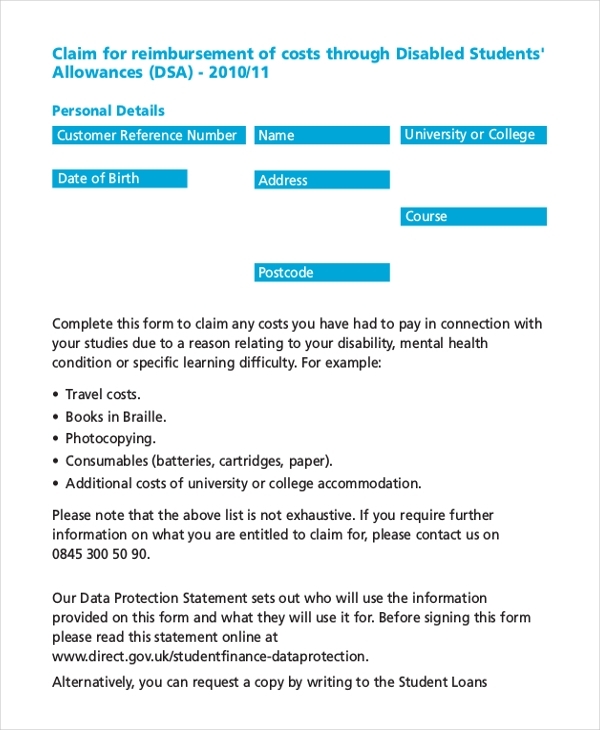 A disability student allowance claim form refers to a document which needs to be strictly filled and completed by students or their guardians on their behalf. 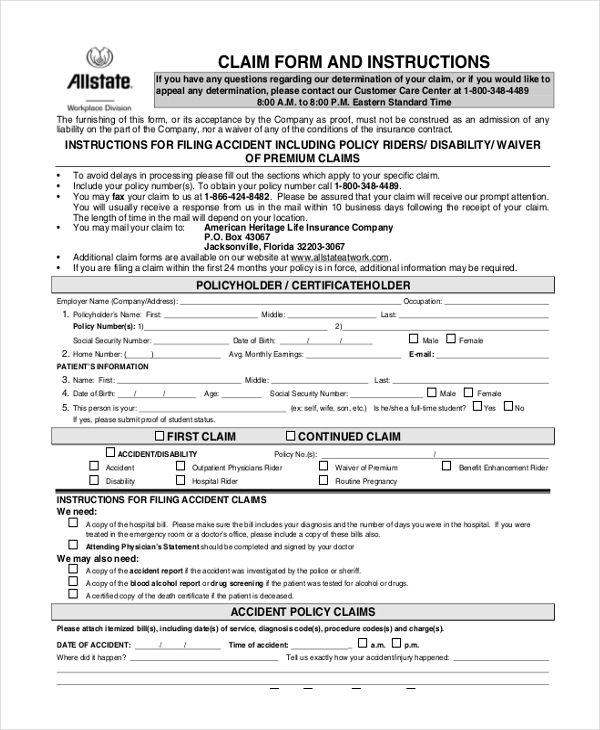 Insurance companies provide disability insurance claim form. Applicants get a number of benefits if and when they apply for a disability cover. Such forms are very elaborate in nature and the contents are very detailed, explaining the benefits and scenarios which are covered in case a disability claim gets filed by the benefactor. 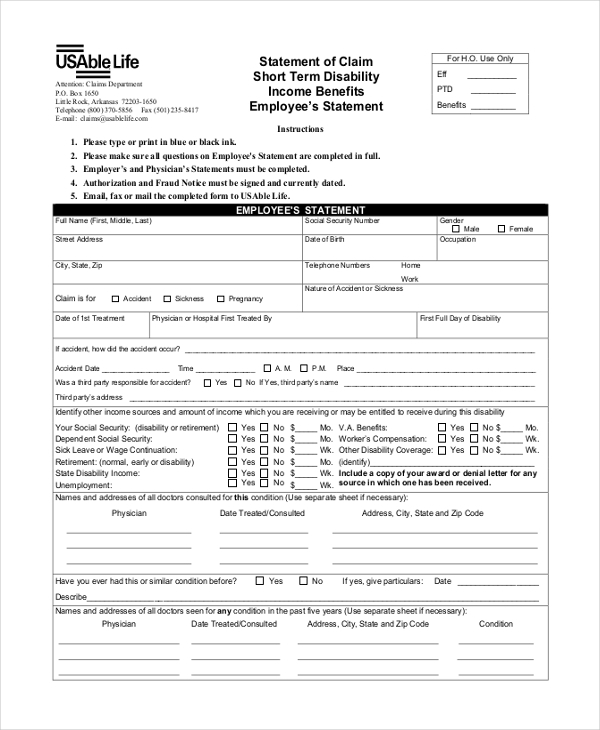 If a benefactor needs to apply for a short term disability claim, he or she needs to seek and fill up a short-term disability form wherein he or she needs to input relevant information regarding the employment as well as stipulate the cause of the incident due to which the disability occurred. A long-term disability claim form is similar to a short-term disability claim form, however, the duration spans over a longer period of time. The form is divided into 9 sections wherein the first two sections are strictly for inputting the claimant’s details and employment information respectively. Details about attending physician also need to be mentioned accurately. This is a simplified step-by-step instructional document that explains the process of filing a disability claim form online. Furthermore, it also specifies the documentation that is required to be attached with the application form. 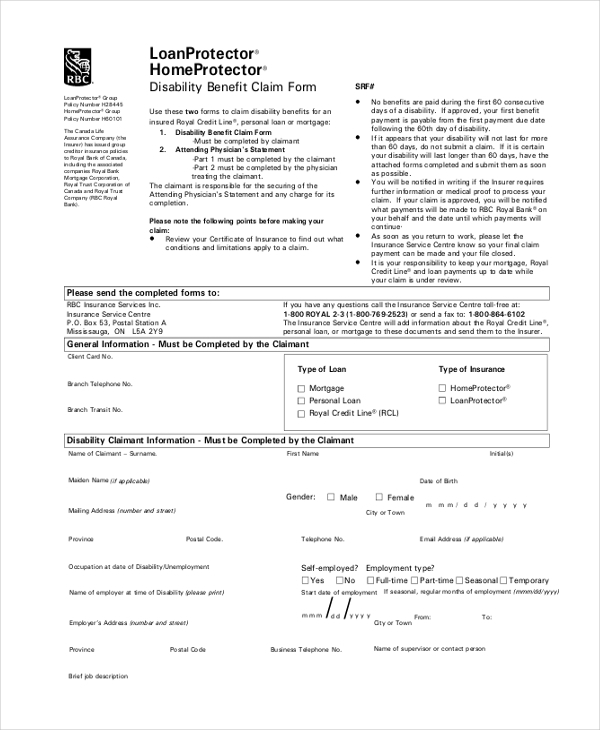 Be it a bank loan or home mortgage situation, in order to safeguard oneself in case a calamity occurs, it’s best to file a disability benefit claim form which lays down all the conditions and specifics in which the disability cover will become applicable and take care of the payments related to loan or mortgage. If a benefactor meets with an accident and suffers injuries, he or she can fill up an accident claim form and receive a reimbursement of expenses from the insurance company. Such a form is segmented into different sub-sections within it. And relevant specifics need to be filled with accurate information. When an individual who may be disabled and not able to go to work, he or she can apply for a disability claim from the recognized authority – could be a governmental body or the company where the benefactor was employed prior to being disabled. The sole and most important usage of disability claim forms are that claimants can file for a monetary compensation from the government or employer till the time the benefactor is hale and hearty again. Of course, if the benefactor is disabled for life, governmental bodies or insurance companies will issue compensation. Disability claim forms are a big boon for the persons suffering from a bodily handicap and cannot go to work because of it. Filing for disability claim at the right time can make all the difference for the benefactor and help them reap the specified benefits in the form. It is important that the form is filled with accurate details and information.